So my hubs was flipping channels on the TV the other day and came across a show that was bbq-ing corn on the cob, he had coconut milk and was basting the cobs so we decided to try it. We didn't write the recipe down, we didn't even get the name of the show, so I guess this is our recipe. OK, I wasn't aware of this when I shucked the corn but your supposed to leave the shucks attached just peeled down so they act as a handle... :) So DON'T SHUCK YOUR CORN ON THE COB. Turn the bbq on low-med heat. 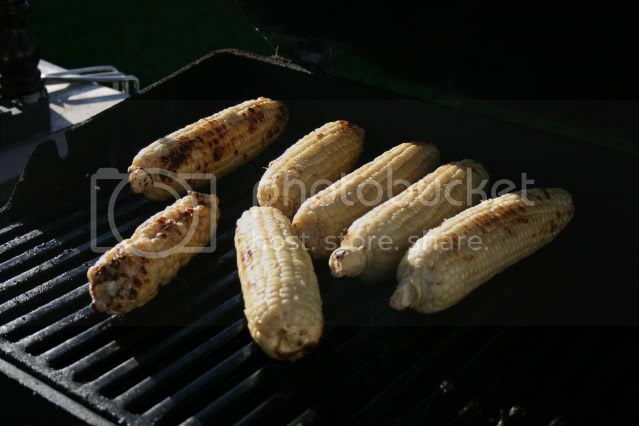 Baste your corn with butter, and then with coconut milk, grill slowly with lid up. Turning each cob slightly to cook and brown evenly (the goal is to carmalize the coconut milk on the kernels) Keep basting the cobs with coconut milk until they are evenly golden brown. Salt to taste. This got a 3 from us, but not because it wasn't good, it was tasty like kettle corn- nearly exact. However we are a buttery salty corn family so the sweetness didn't make us jump up and down. Oh wow, this sounds so interesting! And it really tasted like kettle corn? Wow!